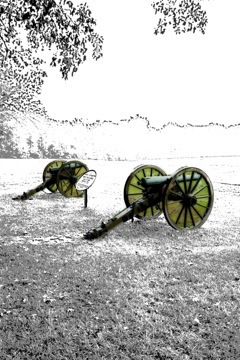 One of our early possibilities for the book cover, Byrne’s Mississippi Battery monument at Shiloh facing the Hornet’s Nest. I inadvertently discovered that my Kindle edition of They Met at Shiloh was inexplicably unavailable for sale on Amazon. I’d uploaded the file for my short story Two Struck Images instead of the file for the novel, so anyone who had purchased the book from May 8 to May 13 didn’t get the right version. D’oh! In the realm of the rest of my life? No big deal. It will get fixed. In the realm of hourly rankings and changes on Amazon? An eternity. But, what could I do? I fixed the problem and then some back and forth with KDP to explain the issue and the rest is a wait. So, now I check every so often to see if and when it will be available to be purchased but at the moment all of my promotion activities have come to a halt. But, this has me to really evaluating the efficacy of some of my promotion activities via social media. I am willing to admit that I may not be using these avenues very well, but overall they do seem to be ineffective at best in driving sales. I rarely look at tweets any more and when I do I’m looking for content tweets, not marketing ones. I suspect others do as well. Facebook as well seems to be a hit and miss proposition at times. Branding? Better for that perhaps or for allowing fans to keep in contact or up to date on what is happening. But, some of that has also become something of a mine that is about played out. I’d been evaluating period images and mining them for what they might tell us of the men and the times and that was fun for a time, but it has now become rote. If creativity abhors anything it is rote activities. As an update to the last paragraph, the book is now up again for sales on Amazon. There is no way I can tell how many possible sales I missed in this time frame. But, Amazon is a world wide marketplace and a US wide opportunity to sell to the same consumers over and over through exposure, but getting and keeping that exposure is the great key. I can at least go on my vacation tomorrow and have one less thing to worry about! Speaking of vacation I will try to share a pic or two from each Civil War battlefield we visit of the next four days this week and some on why we are there at each one and some of the history and how it relates to future books in the They Met at Shiloh series.